Home » Tuxedo_Mini_Mask » Pictures » Sailor Crescent!!! 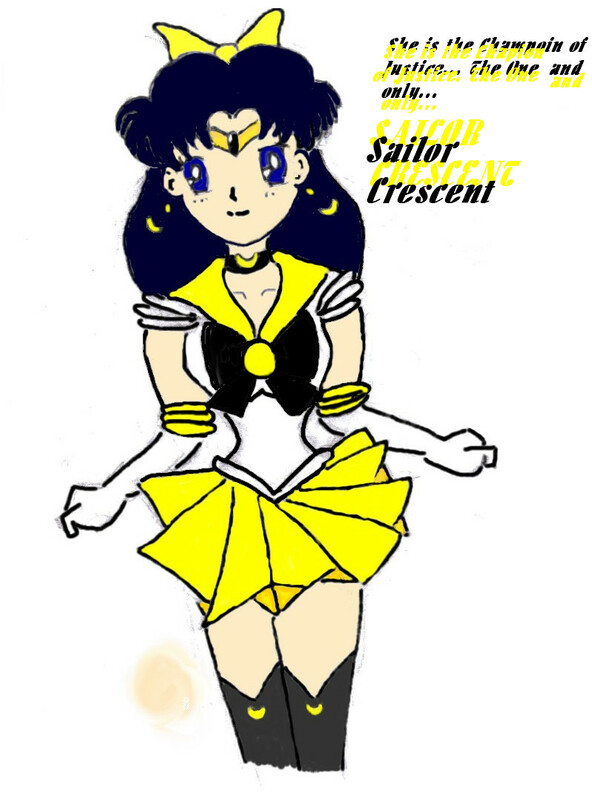 Sailor Transformation Saying- Crescent Prism Power!!! Transformation-(of course its coming from the story) She through up her hand and she started to glow! All of sudden she started floating, and spinning as her long beautiful hair swirled around with her…Crescent Moons went everywhere…Once the Crescent Moons pasted, there were 2 beautiful colored ribbons. One was black and the other was gold. These ribbons burst out of her golden jewel on her chest, and rapped around the rest of her torso. The ribbons flashed as more Crescent Moons went everywhere, and behind the Crescent Moon, was a beautiful white torso, with a black ribbon with the golden jewel on top of it. As she was spinning ribbons started to come out near the bottom of the torso, at the waist. The ribbons flashed as once again Crescent Moons went everywhere, and a lovely yellow skirt appeared. She held her hands up and ribbons went up and down her arms, the ribbons flashed as Crescent Moons went everywhere. She then had white long gloves on. Then she did a flip as ribbons went down her legs and burst into Crescent Moons, and once the moons past, she was wearing black boots with a crescent moon on the top of each boot. Her forehead had a yellow glowing crescent Moon on it. Sparkles went everywhere as her forehead gained a tiara with a black jewel on it, as well as 2 small Crescent Moons, one on each side of the jewel. Her neck gained a black choker with a Crescent Moon on the front of it. Lastly her ears gained ear rings with long Crescent Moons on them. She then turned around and posed. LOL! THANKS! ^^' I love comments!